The state of New Jersey has need for both male and female corrections officers at the local, state, and federal tiers. Due to industry expansion, attrition, retirement, and professional advancement, there is an active recruitment process to find applicants with appropriate qualifications and solid values to join other front line officers in working with the state's approximately 22,452 inmates. Currently, there are 8,345 front line officers fulfilling these roles - by 2022, the Bureau of Labor Statistics forecasts that there will be an additional 417 new jobs created to fill in the field. New Jersey has one federal facility at Fort Dix, and 13 facilities serving adult men and women as well as youth throughout the state - each of which have their own staffing needs. In addition to these facilities, there are a number of county jails used as short-term facilities throughout the state. Interested in a challenging and lucrative career with the state? Read more about becoming a correctional officer in the data below. Warren County Community College ranks first in our rankings with 30 students completing programs in criminal justice out of a total 492 graduates from the 2012-2013 school year. Cumberland County College ranks 2nd in our rankings with 55 students graduating from programs in criminal justice out of a total a thousand students in the 2012-2013 school year. County College of Morris ranks third in our rankings with 121 students graduating from programs in criminal justice out of a total 2,316 students from the 2012-2013 school year. Founded in 1967 and located in Blackwood, New Jersey, Camden County College is a public, 2-year facility that offers certificate programs, as well as associate's and bachelor's degrees throughout its several campuses. The college's mission is to create a strong workforce and citizen engagement. Students that are interested in pursuing a career as a corrections officer are encouraged to apply to CCC's Police Academy. Since 1988, the academy has been certified by the state Police Training Commission to offer corrections programming in order to supply the state with the highest quality of officers for recruitment. 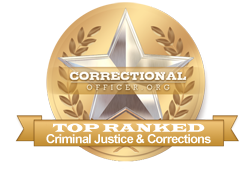 Raritan Valley Community College ranks 5th in our latest rankings with 104 students graduating from programs in criminal justice and corrections out of a total two thousand students in the 2012-2013 school year. Rowan College At Gloucester County ranks 6th in our latest rankings with 82 students graduating from programs in criminal justice out of a total 1,728 students from the 2012-2013 school year. Brookdale Community College ranks 7th in our rankings with 183 students completing programs in criminal justice out of a total four thousand graduates in the 2012-2013 school year. Middlesex County College ranks 8th in our rankings with 126 students completing programs in criminal justice and corrections out of a total two thousand graduates in the 2012-2013 school year. Sussex County Community College ranks 9th in our latest rankings with forty-four students graduating from programs in corrections out of a total 1,032 students in the 2012-2013 school year. Essex County College ranks tenth in our latest rankings with 109 students completing programs in criminal justice out of a total two thousand graduates. If applicable, military discharge "DD-214"
If the above assessment scores are satisfactory, candidates will earn the title of 'Correction Officer Apprentice' and will complete a 16-week training course at the Correctional Staff Training Academy. Those who successfully complete the training course will be posted with a one-year conditional work term where there is a vacancy. The state Department of Corrections in New Jersey encourages stability in the field of corrections by supporting careers in state service, namely as front-line correctional officers. At this time, the median income for correctional officers throughout New Jersey is quite a bit higher at $73,200 than the national median income at $39,800. According to occupational data for the state, available at http://www.careerinfonet.org/occ_rep.asp?next=occ_rep&Level=&optstatus=011000000&jobfam=33&id=1&nodeid=2&soccode=333012&menuMode=&stfips=34&x=52&y=18 and published by CareerInfoNet.org, New Jersey is predicted to experience a decline of 3% annually from now until 2022 as compared to the national growth rate of 5%. This predicted pattern translates into only 270 job openings due to vacancies throughout the state. The table below lists career information collected by the Bureau of Labor Statistics for correctional officers in New Jersey. The table is sorted by total employment, with the largest metropolitan areas listed first.